When you think about chopsticks you should think about eating kuay-tiew! Kuay-tiew is the Thai word for “noodles” and can be spoken as “qui tea-yo”. 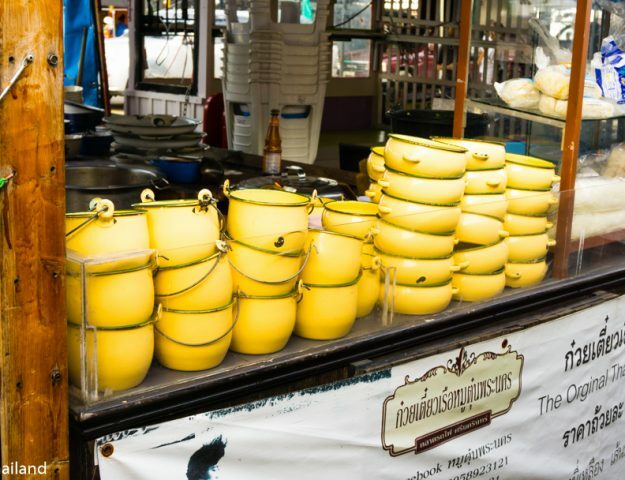 It is a popular choice for Thais and you will see street vendors selling it EVERYWHERE! It is a bright sunny day in Bangkok, and you are so hungry. What should you eat? Kuay-tiew! You may be surprised, but eating a delicious bowl of hot noodles is one of the most popular dishes in Thailand. 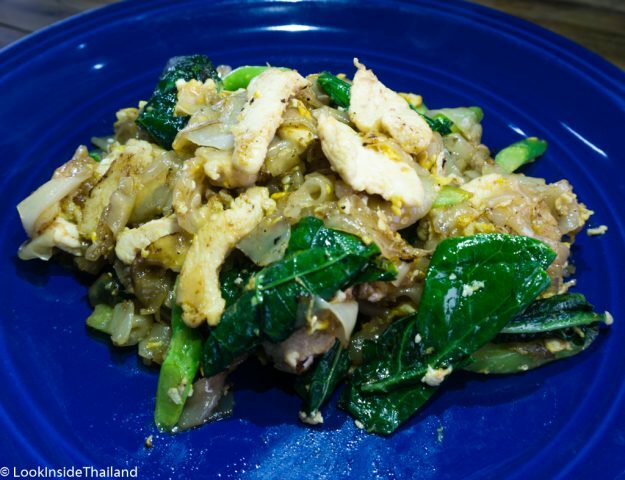 You can ask any Thai what they would like to eat and you will hear som tam or kuay-tiew. 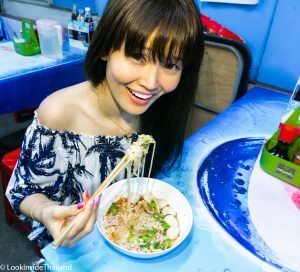 Street noodles are not expensive, it will usually cost about 40 baht ($1.25) and is prepared fast! Kuay-tiew is not just boiled noodles, you can eat it in many different ways. Everyone has their favorite mix or favorite vendor to go eat at. How do I order kuay-tiew? Kuay-tiew is very light and refreshing, but is prepared differently than you might think. Everything is cooked separately and mixed when you order. This allows you to pick what you want, so it will always taste delicious. Can I choose type of the noodles? Point to the noodles you want! 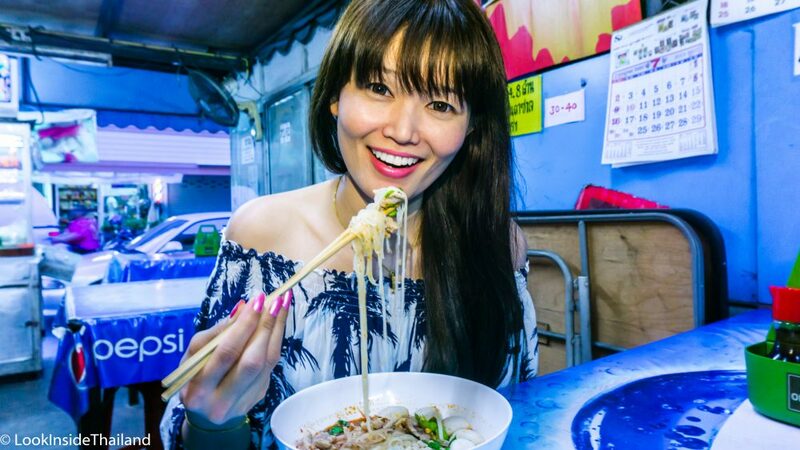 Sen yai, which means “big”, is a thick size rice noodle. 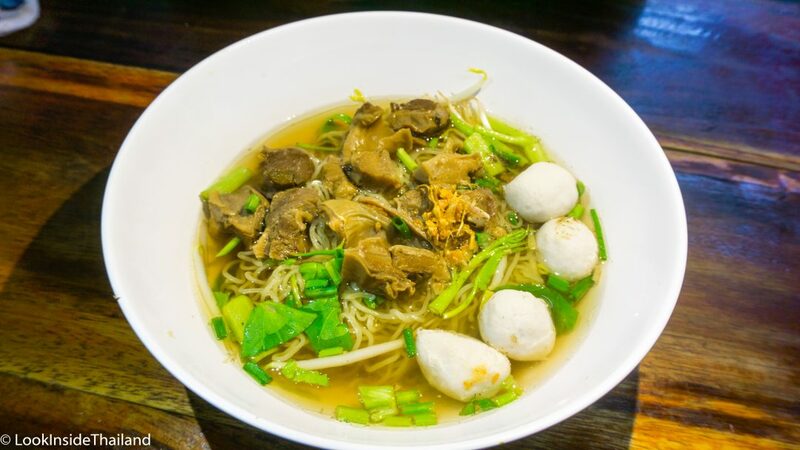 Sen lek, meaning “small”, is a medium sized rice noodle that is the popular choice for noodle soup. Woon sen, is a clear noodle that is made from green beans and is low in carbohydrates and tastes great! Next, it is time to pick the meat! When eating kuay-tiew on the street, you can choose pork, chicken, or sometimes beef. Pork can be found minced or sliced. The Thai word for pork is “moo“, yes, I know you will sound like a cow. Chicken is sliced thin and in Thai, is pronounced “gai (guy)”. Lastly, and less common, is sliced beef. Cows in Thailand are smaller and grass-fed, so the taste will be different than you are used to, but still delicious! The Thai word for beef is difficult to say properly, “neew-ah”. If you would like no meat, you can say “my ow neew-ah”, which means “I don’t want meat”. It is just noodles without the soup! Finally, you have to pick the broth that you would like. Most of the street food carts will have two choices. Nam-sai, is a clear bone broth with a tame flavor that is good for people who cannot eat spicy. Nam-tok is a dark brown broth and is made with a little bit of beef or pork blood. Don’t be afraid! It’s my favorite and very delicious. There are restaurants around Victory Monument that specialize in this type of soup and it’s very popular with Thai people. Delicious, tom yum pork noodles! 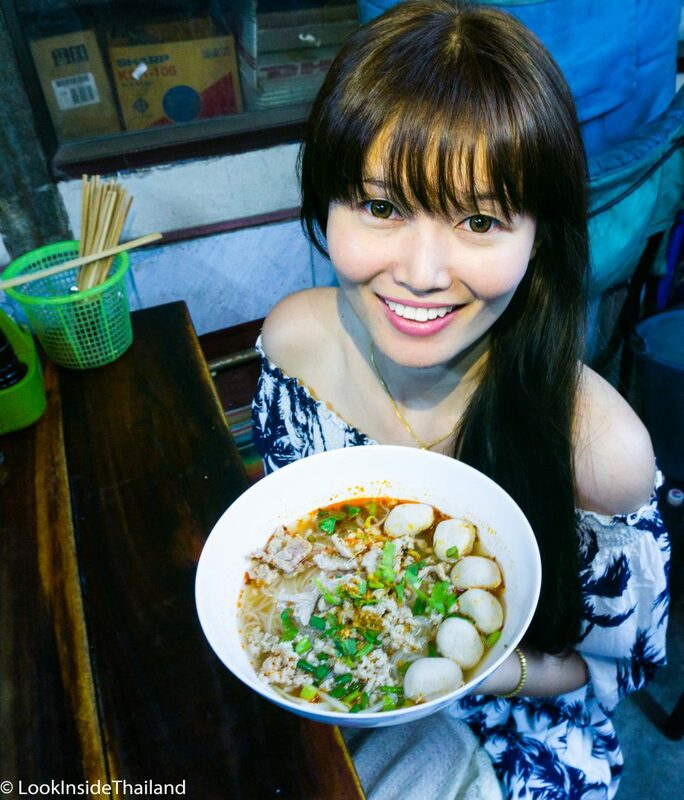 You may also find tom-yum, which is a clear broth mixed with minced pork, lime juice, peanut chop, chili paste, chili powder, and sugar. It is tasty spicy and yummy. The last broth is called yen-ta-fo. This is a pink broth made from tofu sauce that is usually served with squids, fish balls, tofu and cooked clotted pork blood. The flavor has a strong seafood taste and is not tasty to most foreigners. 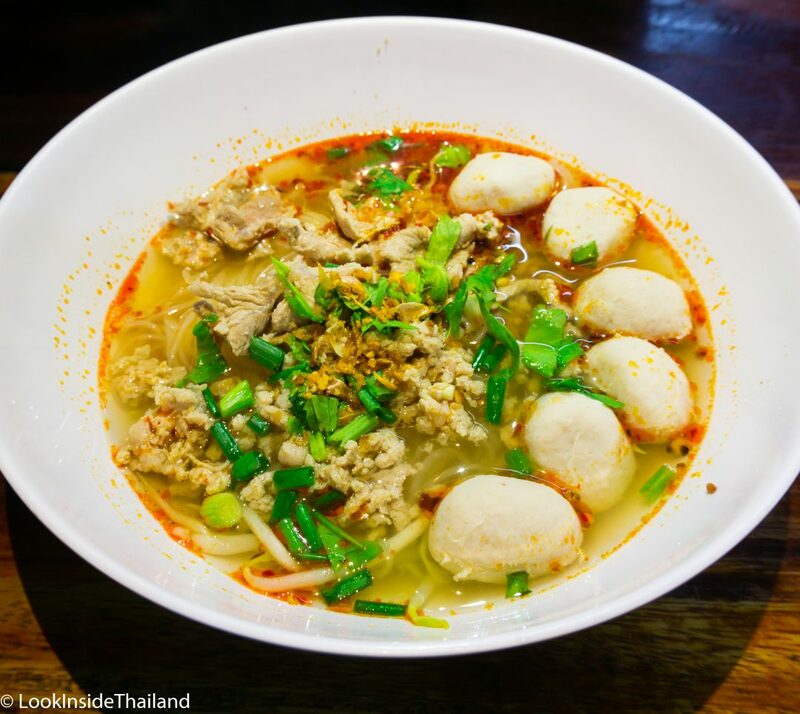 The broth nam-sai, nam-tok and tom-yum should be your first choice to taste authentic Thai noodle soup! You can also get it dry! 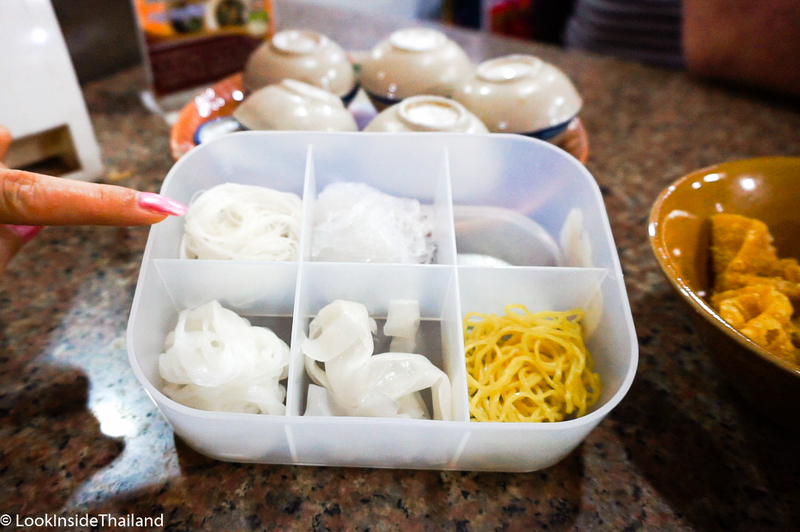 Another option when ordering kuay-tiew at a street vendor is to order your noodles haeng. Meaning dry, kuay-tiew-haeng comes without any broth. A very good choice if you’re taking your food to-go, kuay-tiew-haeng is everything you’d normally find in a bowl of noodle soup wrapped up in a piece of butcher paper for easy eating on-the-go. My favorite! Nam-tok pork noodles! My favorite noodle soup dish is kuay-tiew sen-lek moo nam-tok, which is medium noodle with pork with dark brown blood broth. The flavor and spice in the dark brown blood broth really makes my mouth water. It may sound weird, but the blood broth is really, really good. You shouldn’t miss the opportunity to try it. Anyone can order it in Thai! When it comes to ordering, saying a phrase like kuay-tiew sen-lek moo nam-tok, can be quite a mouthful. First, we ask for noodles (kuay-tiew), next the type of noodle (sen-lek), then we ask for our meat (moo), lastly the type of broth (nam-tok). To help you learn how to order kuay-tiew at a street vendor, here are some examples. 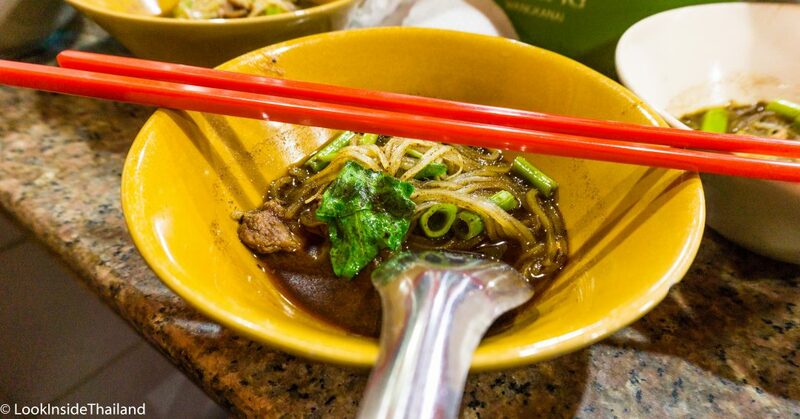 Clear broth soup with beef and thin noodle, kuay-tiew sen-mee neew-ah nam-sai. Dark brown broth soup with thick noodles and no meat, kuay-tiew sen-yai, mi ow neew-ah nam-tok. Tom yum noodles with chicken and egg noodles, kuay-tiew sen-ba-mee gai tom-yum. It might look kind of hard at first, but with a little practice, it gets pretty easy. Don’t worry, Thai street noodle carts usually have the ingredients displayed in a glass case. If you’re having a hard time, it’s really easy to just point at what you want. Thai vendors are very friendly and will be proud you are trying to speak Thai. 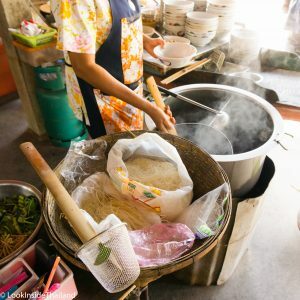 How do I make the flavor of my kuay-tiew really pop? 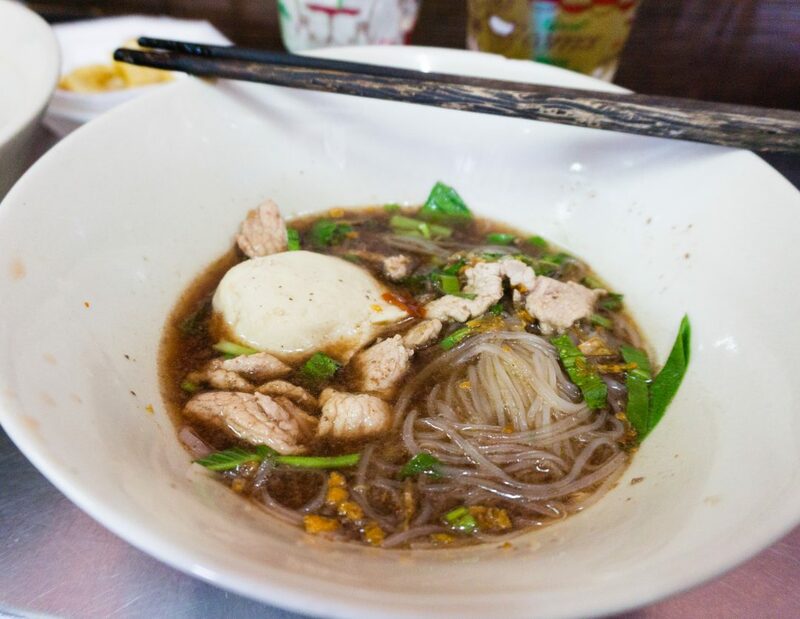 Once you have your bowl of noodle soup, it’s time to eat, right? Not yet! Take a taste, but you’re definitely going to want to try some extra flavor in your bowl. Street noodle carts tables will have little glass jars on them containing extra ingredients. Red ground chilies are always good to add if you can handle the spice! Vinegar (with spice! ), the clear liquid with red and green chilies is a vinegar mix, and can add some tangy flavour to your soup. Sugar, add sugar if you need to tame the spiciness of the soup or you added too much ground chili. Lime juice, add some sour to your tom yum or clear broth! Watch us Thais, everyone has their own special mix, but be careful. We like it super spicy! Bags of noodles and a pot of broth! There’s one large metal pot on a gas burner and a divider that separates it into two half-pots. The larger part of the container holds the broth and the smaller part holds hot water. The vendor cooks the noodles, vegetables, and meat by dipping them into the water in a wire framed basket attached to a stick. Placing them in a bowl once they’re done cooking, broth is then poured on top of them immediately before serving. The whole process of making noodle soup takes about two minutes from start to finish. Yum! Kuay-tiew can be found all over Thailand, but if you want a sit-down unique experience, one of the best places to try is in Victory Monument. A short walk from the Victory Monument BTS station and you are overrun with restaurants serving noodle soup. A favorite at lunch time for Thais and some tourists, it will be busy, fast-paced and fun! How many bowls can you eat!? Happy eating!